Colour rending metrics assign a rating to light sources using pre-defined test colour samples, these metrics are designed to compare a sources’ ability to accurately render colour. TM-30-15 is a new method to evaluate colour rendition; it includes several measures and graphics to evaluate the Fidelity (Rf) and Gamut (Rg) of a source when compared to a reference illuminant – a tungsten halogen. Unlike the Colour Rendering Index (CRI) which only considers the average accuracy of limited colour samples, TM-30 widens the comparative colour samples and offers a more comprehensive way to evaluate overall rendition. 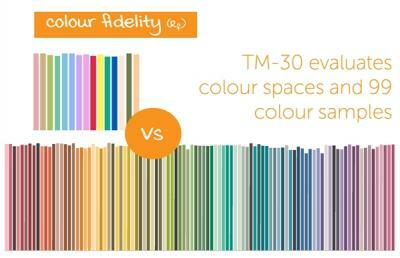 The Fidelity index (Rf) of TM-30 uses the average value of 99 colour samples; CRI however, only uses 8 to generate the Ra value – why does this matter? Well, there are many more than 8 colours within the visible spectrum, so using such a limited sample set to try and describe colour rendering performance means that the reproduction of a subject’s visual appearance may vary significantly under the artificial source when compared to natural daylight. An Rf value of 100 means that the test sources renders the colour samples in exactly the same way as the reference source and therefore is very close to natural daylight. 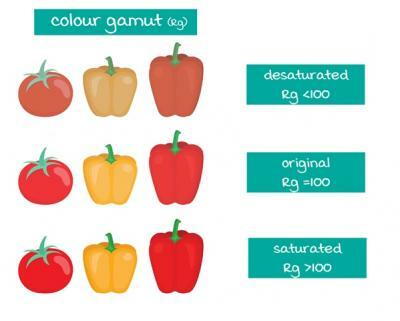 The colour Gamut index (Rg), represents the average saturation shift of the source compared to the reference illuminant. Values greater than 100 can be visualised as an increase in average saturation, whereas values less than 100 represent a decrease. In addition to the two indices, Colour Vector Graphics are used to visually highlight gamut changes. 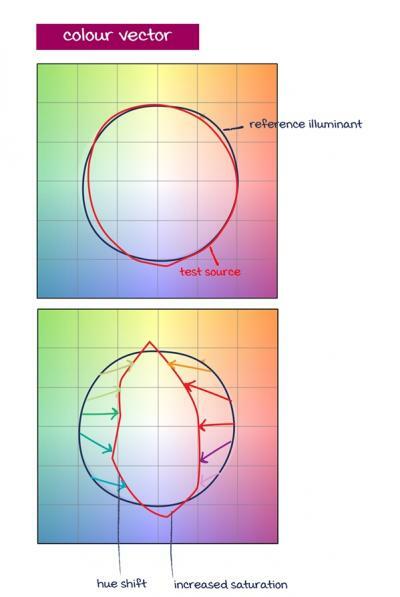 The reference illuminant is represented by the black circle; deviation outside of this region shows an increase in saturation for the given colour, whereas a shift within, shows saturation decrease for the given hue. 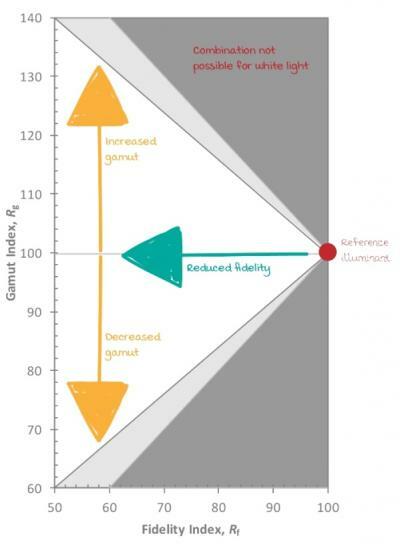 The accompanying arrows between reference and source depict the gamut vector shift. We have a wealth of experience in a variety of industries – retail, hospitality, office lighting and leisure lighting to name but a few. More and more we find customers specifying LEDs with higher Ra as colour quality and rendering grows in importance. In a retail environment eye appeal is buy appeal so making shoes as vibrant as possible is a great sales technique and something clever lighting can assist with. However, fidelity by itself (which is what CIE CRI only considers) is not a complete measure to truly define a light source. It is possible for 2 light sources to have the same Ra value yet the visual perception can be completely different. Simply specifying a high CRI LED may not give you the desired effect. As TM-30 brings in additional information designing and specifying becomes much easier and more controlled. TM-30 quantifies colour fidelity across 99 colour samples (CIE only uses 8), the higher the score (0-100) the more accurately the colours will render compared to the reference illuminant. It then introduces the Gamut index (Rf). 2 light sources with the same Rf value may differ just as those with the same Ra value might. One may well enhance the red whilst another mutes it – there will be a visual difference. The addition of gamut more accurately predicts how objects and spaces will look by measuring the average shift in saturation and hue. Lighting design is all about how the space will look so the greater control you can have of this the better. Whilst TM-30 is not yet a standard it certainly is a useful method that overcomes many shortcomings of CIE CRI. So where does this leave you? As mentioned TM-30 is not yet a standard but, as more and more customers come to us discussing their very specific colour rendering needs, we have aligned our light characterisation reports to include TM-30 testing. We’ll do all the calculations and the hard work and you can benefit from the getting exactly what you want – it’s all part of the service. The addition has allowed customers creating a lighting scheme needing high fidelity and an enhanced saturation of specific colours, such as red, to do just that, for a high end retail display application. Forge designed and manufactured a custom 2700K flexible LED product which allowed for a very simple yet visually stunning and effective solution ideal for retail with an Rf value of 95 and 106 Rg. If colour rendering and quality is of importance to you and your application then you need to speak to Forge today. We have a fantastic team, including industry specialists and technical gurus, ready to understand your needs and design and manufacture a solution just for you – the TM-30 testing is just one of the many additional benefits you can enjoy. Check out example test reports below.